Two new teaching tools are helping faculty in the Department of Civil, Construction, Industrial and Mechanical Technologies. 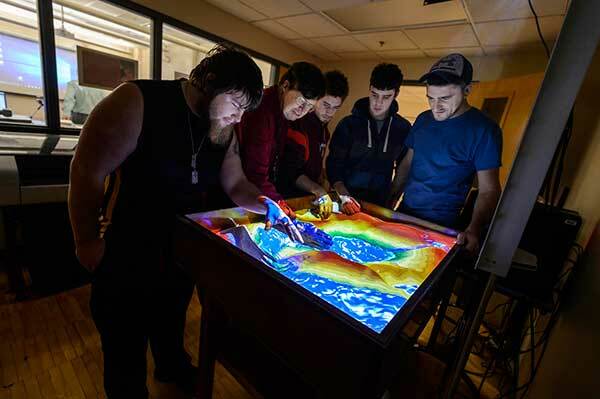 Professor Bill Darling, center, and his students work with the Augmented Reality Sandbox located in Hudson Hall. The sandbox is a new teaching tool that was built by staff and faculty this past summer. They call it the Augmented Reality Sandbox, and no, it's not going to take you to another dimension in time and space, but it's become an effective teaching tool for explaining topography, hydraulics, drainage and elevation for students in the Architecture, Civil Engineering and Construction Technologies programs. Developed a few years back by scientists at the University of California at Davis, the sandbox uses advanced computer software and 3D projection to create a unique hands-on teaching tool. Moving the sand in the box creates a landscape, complete with elevation lines. Hold your hand over the box and it becomes a "cloud" dropping water that flows throughout the landscape. Faculty member Craig D'Allaird discovered the UC Davis website for the Augmented Reality Sandbox and spread the word among his colleagues. With free software available online, all that remained was to get the hardware and have someone build the sandbox. Over this past summer, Technology Lab Assistant Karl Hoegemann built the box and helped set up the computer and camera needed to run the system. Other faculty members added their expertise in programming. The sandbox made its debut this past fall, and it was a big hit with students. Faculty members are still discovering new uses for the sandbox, but Professor Bill Darling said it's a perfect fit for the Civil Engineering Technology's hydraulics and drainage classes as well as for teaching the basics of topography. Technology Lab Assistant Karl Hoegemann, right, a licensed drone pilot, works with Professor Bill Darling and some students in his surveying class. The class set up an area on the campus quad that the drone was able to scan, photograph and render into a three-dimensional map. From construction to agriculture, drones are changing the way many industries do business. That's why the college's School of Engineering and Industrial Technologies thought it was a good idea to start integrating drone use into its instruction. This past fall, Technology Lab Assistant Karl Hoegemann, who is a licensed drone pilot, began collaborating with several faculty members on ways to integrate drones into their coursework. Students in the Civil Engineering Tech Transportation class, for example, are asked to do traffic studies each semester. What used to be a manual process was changed up this year as Hoegemann's drone hovered over the intersection of Vandenburgh and Morrison Avenues and students could remotely count cars as they passed through the intersection. Combining drones with high-powered scanning software can help with Professor Bill Darling's surveying classes, too. While drones aren't necessary ready to handle the intricacies of land surveying, they can pull off a three-dimensional map of a targeted area. "You just tell the drone what you want it to do and it flies the grid pattern. Six hours later, you can have a three dimensional map of the space you've selected," Darling said. "The drone is nothing more than a high tech tool, but what we've been doing this semester has been proof of concept," said Darling. "We have an idea and see if the drone can help us do it better or easier." "Finding ways to reach the students and engage learning is always a challenge. In this new technological society the ability to see, touch and feel becomes necessary for understanding difficult engineering concepts," said Department Chair Dr. Christine LaPlante. "The department is finding that use of these tools has assisted student success in understanding many of course concepts."